This is the LG G2 D802 digitizer touch screen only. This part does not include the LG G2 LCD screen. This item includes the LG G2 digitizer and front glass already attached. The D802 model of the LG G2 is the global version. 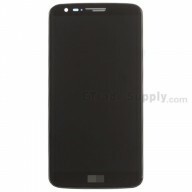 This touch screen digitizer is only compatible with the LG G2 D802. Please check your model before ordering. See our LG G2 models guide for help. This LG G2 touch screen is the Black one with LG logo and is100% OEM manufactured and assembled. This LG G2 digitizer is hermetically attached to the LCD.Special tools and skills are required for replacement. The flex cable of this G2 D802 touch screen digitizer is fragile and easily damaged. Handle carefully. The installation of this LG G2 D802 digitizer touch screen should be done by a qualified person. ETS is not responsible for any damage caused during installation.